IP profiles are presented as informational screens for specific workstations in a monitored network, similarly in concept with MOREAL dashboards which in turn focus on a network as a whole. For a more technical introduction, refer to the IP Profiles technical article. Additionally, for more information regarding the meaning of metrics listed in IP Profiles please consult the MOREAL Metrics documentation. Statistics view: This page has a similar layout to MOREAL dashboards but the displayed information is specially selected to provide meaningful statistics for this level of analysis. The behavior of an entity may be observed across multiple dimensions, including the dimension of time. 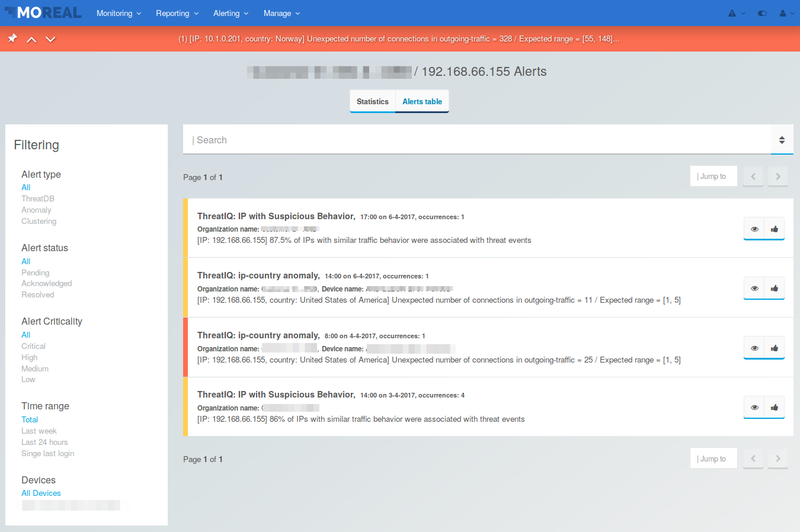 Alerts table: This page presents a list of recent alerts for a given IP, allowing an analyst to jump from the bird-eye view given by the statistics page to a more detailed view of the events related to this entity. You may visit the profile for a specific IP, either by clicking at the “Most active IPs” button under the organization management page, or by clicking at the “View IP Profile” button in the detailed view of a specific alert. 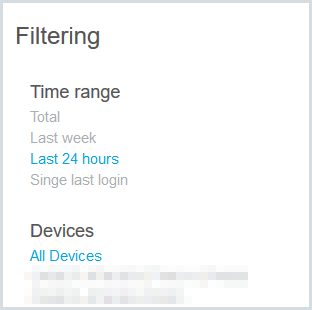 The left column in the “statistics” view contains filters you can use to change the displayed time window and optionally select a specific network device in case the given entity is connected to more than one. Devices: Optionally select a specific network device in case the given entity is connected to more than one. Title: Organization Name / IP (Asset friendly name, if given). Number of Alerts: The number of recent alerts (for the selected time window) including ThreatDB, Anomaly Detection and Behavioral Clustering alerts. For a given time & device context, this line chart shows the number of total IP connections (inbound, outbound, private) varying through time. This line-chart displays the number of alerts varying throughout the selected time window and grouped by the alert type (ThreatDB, Anomaly Detection, Behavioral Clustering). For more information regarding these alert types refer to the related technical articles. Top Services: this list contains the top 5 different services in terms of the number of connections that the given IP has been observed to use in inbound, outbound & private traffic logs. Top Countries: this list contains the top 5 countries in terms of the number of connections that the given IP has been observed to communicate with based on inbound & outbound traffic logs. Top ISPs: this list contains the top 5 ISPs in terms of the number of connections that the given IP has been observed to communicate with based on inbound & outbound traffic logs. Top Cities: this list contains the top 5 cities in terms of the number of connections that the given IP has been observed to communicate with based on inbound & outbound traffic logs. Top External IPs: this list contains the top 5 external IPs in terms of the number of connections that the given IP has been observed to communicate with based on inbound & outbound traffic logs. 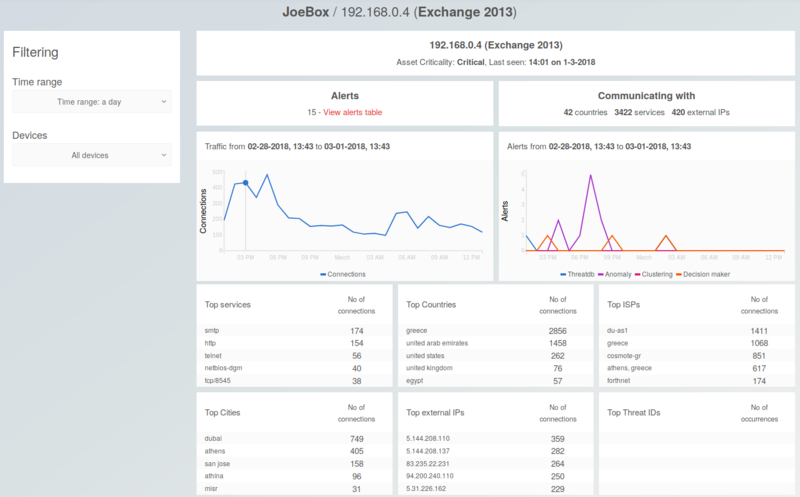 Top Threat IDs: this list contains the top 5 unique threat IDs in terms of the number of occurrences as observed in inbound, outbound & private threat logs. The central area displays the filtered list of alerts which has the same layout and functionality as the list in the central Alerts management page.